Lee (John Davies), a screenwriter specializing in horror films, is having a bit of writer’s block. Looking for a place to work without distractions and get his creative juices flowing again, Lee rents a spacious country home. However, it turns out there’s one small detail the realtor ( Tessa Wood) didn’t mention until Lee is just about ready to move in: an old blind woman (Vivien Bridson) lives upstairs. Lee’s a bit annoyed not to have been told, but decides to move in nonetheless. It turns out there’s also an attractive neighbor woman named Cassie (Georgina Blackledge) who shows up unexpectedly to “borrow a cup of sugar”. Lee and Cassie hit it off and begin a tentative romance. Meanwhile, Lee’s sleep is disturbed by nightmares, and apparently the blind lady has a penchant for sneaking downstairs and turning on the record player. Or could it be… ghosts? 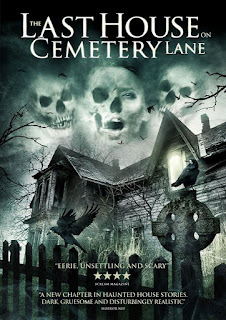 So yeah, LAST HOUSE ON CEMETERY LANE is a pretty by the numbers tale of the supernatural. It’s also amazingly dull. Nothing wrong with a movie being a slow burn, but it’s a wonder the fuse stays lit at all as slow as this one creeps along. And sure, quiet horror is nice now and then, but this is so quiet it’s almost a silent movie. There are also some odd steals from other movies, like a scene (right down to a music cue that comes pretty close to plagiarism) that quotes John Carpenter’s HALLOWEEN. I’m all for the occasional bit of homage, but it really feels out of place and distracting here. On the plus side, the cast is good and the film, although minimalistic, is well made. I kept wanting to like it, but eventually the tedium and just wore me down. I guess at least it isn't found footage. 2 out of 4 stars.